Looking for a vacuum with a high degree of suction, good maneuverability, and an affordable price point? Then maybe it’s time to check out the Dirt Devil Easy Lite canister vacuum. As a canister vacuum, you have the ability to take out a localized mess with more power than most vacuums. Does this Dirt Devil vacuum have what it takes to earn your respect? There’s only one way to find out! Continue reading below to discover if the Dirt Devil Easy Lite is the best canister vacuum for you. This canister vacuum has a strong degree of suction on all indoor floor types. The Easy Lite is lightweight and easy to maneuver, as its name suggests. The cleaning mode does not indicate which suction level should be used on specific floor types. The Easy Lite’s clog indicator light does not always catch when a clog is occurring. The Dirt Devil Easy Lite canister vacuum has a different design, but I would classify it as a sharp, modern aesthetic. The hard lines and bright red color scheme help round out the overall look of this vacuum, while the low profile, but sturdy build allows users to take this vacuum almost anywhere. Designed with a bagless system, the dust bin is quite large and the vacuum itself is powered by a 20 foot cord and 12 amp motor. This combination offers a strong degree of power / suction. The Dirt Devil Easy Lite canister vacuum cleans through a bagless, cyclonic system. Dirt and debris are sucked up through the 11″ cleaning path and put into a cyclonic motion as it enters the dust bin. By doing so, the dust bin is able to separate dirt and debris as they make their way through the filter. Fewer allergens are pushed back out of the vacuum and more dirt / debris is able to be cleaned up. This canister vacuum uses a cyclonic cleaning method which feeds into a bagless system. All of which is powered by a 12 amp motor. This Dirt Devil canister vacuum is about average with regard to its size. The unit weighs a total of 11.8 pounds, measures 22″ in length, 13.2″ in height, and 12.8″ in width. The overall stature of this unit is nice, as it is not overly large or too small to handle bigger messes. 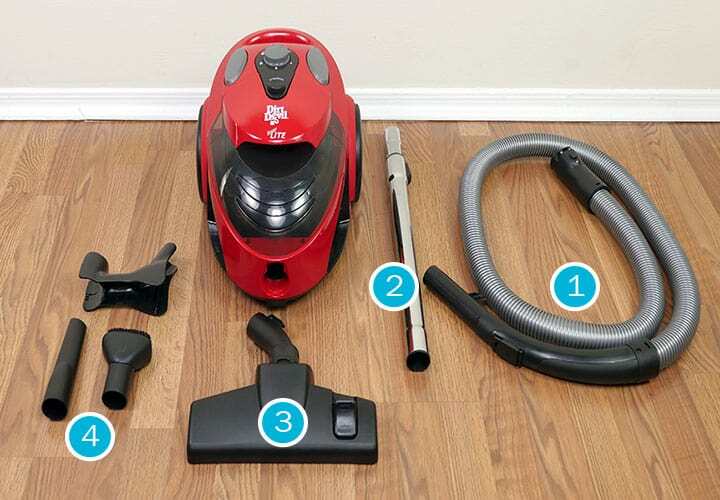 The following vacuum cleaner tests are designed to show how the Dirt Devil Easy Lite performs on different surfaces, picking up a variety of debris types. The Easy Lite canister vacuum had its ups and downs throughout the hardwood floor tests. Rice, kitty litter, and sugar proved to be no match for this Dirt Devil, but cereal was a different story. Although each of the other three debris types scored a 99%+, cereal came in with a much lower number, only being cleaned up to a level of 28%. During the cereal test, suction stopped after about 10 seconds due to clogging. This was not something I initially expected, but after examining the size of the suction path, the clogging made sense. That said, the “clog” light indicator located at the base of the vacuum did not turn on, which came as a bit of a surprise. The low pile carpet test had similar results to the hardwood floor tests. Rice, kitty litter, and sugar all reached cleanliness levels of 99-100% while cereal fell behind, bringing home a score of 33%. Once again, clogging was the main issue behind the low score. The high pile carpet tests did not vary from the hardwood floor and low pile carpet tests, as the results came back in a similar fashion. Sugar dropped ever so slightly, but still scored a 99%. Kitty litter and rice both hit the 100% mark and cereal was cleaned up to a level of 54%. Cereal did improve over the three floor types, but the most the Easy Lite was able to clean up was 54%. Using the Dirt Devil Easy Lite canister vacuum is simple. Choose the cleaning tool you would like to use, plug the vacuum in, and get to work. There is no complicated method to using this Dirt Devil appropriately, as each tool is easy to snap on and begin using. Swapping back and forth between the five cleaning modes also plays a role in the overall usability of this Dirt Devil vacuum. A small knob sits at the base of the unit and can be turned with ease to choose between each level. Two of the end modes are labeled “min” and “max,” and there are three others between the two. This is how you distinguish between the suction power you would like to use. HANDS FREE – If you would rather sit back and let the vacuum do the work for you, check out our robot vacuum reviews. Roomba vacuums, including the Roomba 980, Roomba 890, and Roomba 690 are all great choices. Another cool feature is the “clog” light indicator. Whenever the vacuum is clogged, a red light kicks on to let the user know to stop vacuuming and remove the clog. That said, there was a short setup required with the Easy Lite. Although the main unit comes assembled, users do have to piece together the hose, wand, and cleaning head in order to begin using the vacuum cleaner. The setup is rather quick and painless, but I could see some confusion occurring during the setup for some folks. If you don’t take a look at the directions, it can be frustrating deciding which ends of the hose go into the vacuum and which connect to the wand. Additionally, if you don’t snap the head onto the wand at the correct angle, you will have no maneuverability. Therefore, users must pay attention to how they piece this all together to ensure it is being used correctly. Maneuverability is certainly a pro when it comes to the Dirt Devil Easy Lite. A 10′ reach is available to the user, in addition to a 20′ cord. Therefore, you can actually wheel around 20′ away from where the vacuum is plugged in and reach another 10′ from there, which in total, gives this Dirt Devil vacuum a 30′ cleaning radius. The wand starts at 32.5″ and is able to to extend out to 45″. Extending the wand fully is where the 10″ reach comes into play, as the hose is 6′ by itself. With two large wheels attached to this vacuum, it is able to roll quite easily. Even just pulling the hose / wand I was able to roll the Easy Lite around without actually tugging the main unit. This is a nice added benefit, due to the vacuum’s lightweight design. If you need to pick it up and move it, the weight is not overbearing, compared to some upright vacuum cleaners or other canister vacuums. RELATED – If you need a handheld vacuum to go with your canister vac check out our reviews on the Shark Pet Perfect 2 and Dirt Devil Scorpion Quick Flip, they are two of our top rated favorites. In addition to the hose and extendable wand, the cleaning tools included with the purchase of the Dirt Devil Easy lite make cleaning hard to reach, or more specific locations, much easier. The crevice tool is able to reach into smaller spaces (couches, cars, etc. ), while the dusting brush has a layer of soft bristles attached to the head of the tool, which helps to lift dust while also vacuuming a specific area. All things considered, this vacuum cleaner maneuvers well. On an annual basis, you can expect to pay between $14 and $24 to maintain the Dirt Devil Easy Lite canister vacuum, depending on how often you change the filters. Maintaining the Dirt Devil Easy Lite is not a tough task, but certainly one that needs to be paid attention to. Each of these filters plays a crucial role in how this Dirt Devil vacuum seals in dirt, dust, and allergens, as well as how the vacuum performs on a daily basis. Users will need to be sure to replace these every 6-12 months, or as needed. At 3′ away, the Dirt Devil Easy Lite canister vacuum emits 74 dB of sound. After examining the price, performance, maintenance costs, maneuverability, and other factors, I would conclude that the Dirt Devil Easy Lite vacuum offers an above average value. The low price of this unit does not reflect the high level of performance you receive in return. Although some larger debris types could cause clogging issues (cereal in our case), the suction power of this Dirt Devil vacuum is hard to beat. Users have the ability to place the wand directly on top of a debris field and clean is up in one or two short passes, as compared to some of the other more traditional vacuums. Dirt Devil offers a 2 year warranty on both the parts and motor. The return period is 30-days from the purchase of the unit (via Amazon). Who Should Buy the Dirt Devil Easy Lite Canister Vacuum? The Dirt Devil Easy Lite canister vacuum offers a lot of power in a versatile unit. The 30′ cleaning radius, five different suction power modes, and bagless system create a vacuum cleaner that could benefit a wide variety of users. Bagless system – This Dirt Devil canister vacuum uses a dust bin instead of a bag. By doing so, users do not have to worry about changing a bag as a part of the maintenance, and emptying dirt / debris is much easier. Extendable wand – Included with the purchase of this vacuum is a 32.5″ wand that has the ability to extend out to 45″. The extra length you’re able to get from this wand allows users to reach even further when cleaning. Low cost – The lower price of this vacuum does mean you get a little less in terms of performance in certain areas, but if you’re looking to save some money and still get a well-rounded canister vacuum, the Easy Lite is a great option. For more information on the Dirt Devil Easy Lite visit Amazon.com. The Dirt Devil Easy Lite canister vacuum is an inexpensive machine that’s equipped with a surprising level of suction and overall performance. The 30′ cleaning radius allows you to clean an entire room or more from a single plug. Cleaning performance was strong across the board, only faltering on larger debris (cereal, in our test). While there are shortcomings, the low price point still make this a solid value overall.